What can I expect at Wine Festival Winchester? To have a delicious time! The festival is taking place in the Bapsy and King Charles Halls in Winchester’s beautiful Guildhall. They’re spacious rooms and there will be many tables between the two rooms, each with an exhibitor showing wines, food or other things. Dip in and out as you choose, we have wines of all styles from English fizz to vintage port. The programme will have details of all wines and exhibitors on show. Can I plan my visit? Here’s a list of who exhibited at the 2018 festival and we will be announcing our 2019 line up shortly. Susie and Peter are on the floor for the duration of the festival, as well as leading masterclasses, so you can also ask them for tips – and clink their glass at the same time! Plus, we also have our Follow Your Taste app to make discovering new wines fun – plus be in with a chance of winning the odd prize while you’re at it. What’s this I hear about a festival app? 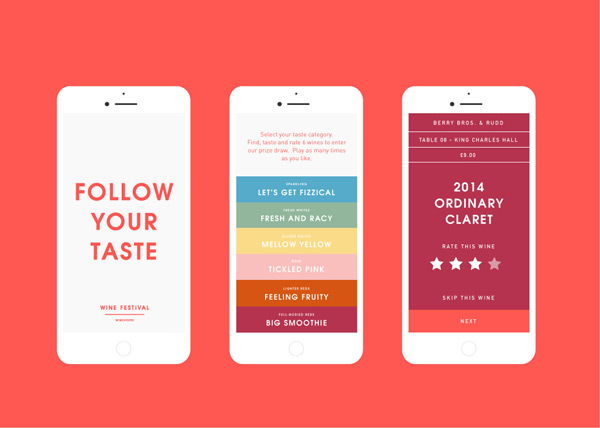 Our hugely popular Follow Your Taste app launched at the 2016 festival. It’s a treasure hunt for thirsty grown-ups. You select your preferred wine style. Then you have to find and rate six wines of that type around the festival, generated at random by the app. It’s your own, personalised wine walk. Prizes are up for grabs. Best of all, you automatically get sent the full list of wines you rated after the festival – so no more racking brains to remember your favourites! And you can use the links to buy if you want. We’ve revamped the app so you can now Search for wines/exhibitors yourself too – a virtual programme, if you like. NB: you will be asked to enter your name, email and postcode to register for the app. These details will NOT be shared or used for marketing – it’s so we can contact you if you win prizes, and also for data analysis purposes. Absolutely. It’s all under one network, just log on when you get there (details will be on the back of the programmes or just ask any staff or at one of our Follow Your Taste hubs). Tweet away! We’re at @winefestwinch or #FollowYour Taste. Facebook, Twitter and Instagram. Show off! Is it all wine or will there be food and other things to taste? We are delighted to have delicious foods at the festival. In 2018 the event featured freshly handmade chocolates by Chococo, charcuterie by Parsonage Farm, pies by Jake’s Artisan Foods, all manner of deliciousness from Thyme & Tides plus a selection of delicious cheeses & home-made chutney from historic local restaurant The Chesil Rectory. There were other tasty titbits around the place too! Each session lasts four hours. There’s loads to see and taste but don’t try to do too much. Better to take things nice and slow – you’ll get more out of it that way. Make sure you take time to chat, drink our refreshing and locally sourced Hildon natural mineral water and visit the food tables. Go at your own speed and only spend as long as you feel comfortable at the festival. And remember, if you like what you’re sampling then do buy on the day to take advantage of festival discounts. I remember it being a bit busy to get in on Saturday evening..?! Apologies if you had to wait at any stage. We’ll try our hardest to get you in as swiftly and efficiently as we can. Saturday evening tends to be the busiest, which we’re very aware of. You’ll need to bring your ticket. Either a print out or digital version will do – we just need to scan the QR code or bar code on your ticket, then we’ll stamp the back of your hand. Please remember your ticket is only valid for the session you’ve booked, and is strictly non-transferable. If you’re arriving in a group, you don’t all need to arrive at the same time – just bring a copy of the ticket and we can scan you in separately if needed. You get a free glass, programme and bag so no need for those! What do I get for my money at the festival? A free wine glass, free access to hundreds of wine samples, a free Wine Festival bag, exclusive festival discounts from retailers – and a chance to clink glasses with Susie & Peter and join in the fun! What should I not miss out on at the festival? Beyond the hundreds of beautiful wines to taste, there’s lots to do. Enjoy a masterclass, enter the prize draw, sample local food, hunt down a unique gin… In short: have fun! I’m keen to learn a bit more (but nothing too serious). What can I do? Book into one of our masterclasses. You can find more details on our masterclass page. If you have trouble, any of our staff will be delighted to help. How can I ensure I taste as many wines as possible? Can I buy wine at the festival? Absolutely. It’s a great way to pick up wines for the festive period or for presents. You can buy bottles on the day or, better still, order for home delivery later. And, because exhibitors are offering exclusive festival-only discounts and incentives, it’s actually a great value way to buy. Details of special offers will be in the programme. There are other things to buy at the festival if you’re on the lookout for fun wine-related gifts. We have aprons with our cheeky Follow Your Taste straplines (whether you’re a ‘big smoothie’ or ‘like it fresh & racy’) plus wine festival coasters and tea towels. Or you can pick up our funky wine bags to take away your purchases. Come and see us on the day. You bet! You get a free wine glass and wine bag to take away as part of your entry fee. All wine samples are free of charge. I’ve heard about a prize draw..? Yes, we run a prize draw on the day. Don’t forget to bring your cash and buy tickets on the day to support a great cause and be in with a chance of winning some amazing prizes. You can find more details on our prize draw page. If I want to make a proper day of it in Winchester, what can I do? Winchester is a beautiful, historic city with plenty to see and do. What’s more, its renowned Christmas market and ice rink is taking place just round the corner, in the Cathedral Close. If you feel peckish after the tasting, Winchester is packed with fantastic restaurants from established names like The Chesil Rectory, Black Rat, Palm Pan Asia, The Willow Tree, Corner House and Ghandi to newer venues like Rick Stein Winchester, River Cottage Winchester Canteen, Kyoto Kitchen, Côte, Manow Thai, Piquant and Josie’s. There’s also the farmers’ market on the Sunday in town. ‘A beautiful festival in a beautiful city’ is how one person summed it all up. Unfortunately, we can’t allow any children into the venue. If you’re lucky enough to look under 25, you will be asked for ID. Please don’t take offence, we have to do this. Sadly not. We love kids but sadly due to licensing and logistical reasons we can’t allow any under-18s, except for babes in arms* at the Wine Festival. We hope this gives parents the perfect excuse to have some well-deserved time off. * Babies must be under 12 months old and will only be admitted if securely strapped to the parent or carer by way of a baby carrier, papoose or baby sling. No prams or pushchairs will be admitted to the venue. What about planning my travel? Winchester is extremely busy at this time of year, with the wine festival and Christmas market taking place. Please plan ahead and leave plenty of extra time. There are car parking options in town and at Park & Rides (the buses drop off near the Guildhall). But we’d advise public transport or taxis. See the location page for more details. Finally, why not consider staying over and making a weekend of it? There are many nice places to stay in and around Winchester. Accommodation in Winchester includes the Hotel du Vin, The Black Hole, No 5 Bridge Street, Wessex Mercure and Hannah’s B&B, while there are many great places outside the city. The King’s Head Hursley is run by wine lovers, for example. Is the wine festival happening next year? Yes, the festival is an annual event that will take place on the last weekend of November every year. The 2020 dates are 28-29 November.